Therefore they set taskmasters over them to oppress them with forced labor. They built supply cities, Pithom and Rameses, for Pharaoh. But the more they were oppressed, the more they multiplied and spread, so that the Egyptians came to dread the Israelites. The Egyptians became ruthless in imposing tasks on the Israelites, and made their lives bitter with hard service in mortar and brick and in every kind of field labor. They were ruthless in all the tasks that they imposed on them. The Israelites had once been honored guests of Egypt, rightly so because Joseph had saved Egypt from starvation. The Israelites prospered. But now there is a new pharaoh and gratitude has been replaced by fear, envy, and prejudice. The Israelites are now held in slavery and brutally oppressed. The hexagram consists of two trigrams, Wonder and Chaos, in which weakness is oppressing strength. In the upper trigram, the two strong lines are being held down by a single weak line. 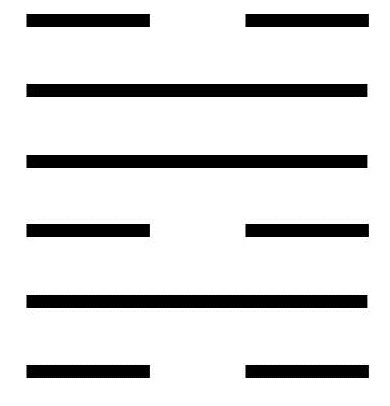 In the lower trigram, the single strong line is surrounded and suffocated by weak lines. Thus we see two aspects of oppression, holding down and suffocating. To recognize when the lesser oppress the greater. To know that the strength and wisdom gained in the struggle with the oppressor can prepare the liberator for ultimate success. To meet adversity with the good nature that eventually leads to success. To protect our spirits, because if the oppressor breaks our spirits, we have lost. To follow the example of a tree in the wind, bending so as not to break, and then springing back when the time is right. To remember that Ego is a poor guide in responding to oppression. To understand that in times of oppression, even the wise have little influence. To use this time to cultivate the deepest inner strength. A moving line in the bottom position reminds the oppressed how important it is to remain inwardly strong. If the oppressed allow weakness to take over, then oppression will quickly overwhelm. This is the beginning of a downward spiral in which the oppressed fall ever deeper into despair. It is the spiral of despair that now must be overcome even more than the oppression itself. A moving line in the second position points to a different kind of oppression, an inner oppression. Life seems great; everything one might want is in abundance. But the abundance of stuff is superficial and provides no lasting peace. Then a teacher comes and shows a new way. The teacher is calling for disciples. There are still obstacles that must be addressed before this call can be answered. These obstacles cannot be overcome with physical strength; they must be overcome with spiritual strength. One must take the time to gather that spiritual strength through prayer and meditation if one is to be successful. A moving line in the third position warns against indecision. Indecision results in reckless behavior that aggravates the oppression. Grasping at straws that provide no support makes the situation even worse. Butting your head against the wall does nothing to move the wall. Such behaviors drive away even the most loving partner. A moving line in the fourth position describes a generous soul who wants to help those in need. But rather than moving decisively, the benefactor hesitates and meets obstacles. The benefactor is then drawn back into the spheres of the upper class, where concern for the needy is ridiculed. Now the would-be benefactor is compromised. But this is a temporary situation. The benefactor’s natural goodness will lead back to Wisdom’s way. A moving line in the fifth position describes one who wants to help, but is isolated. Those who have responsibility to provide support are unwilling. Those who need the help turn away. Fortunately the situation is temporary. The best use of this time is to meditate and pray for those in need. A moving line in the top position describes one whose oppression can be easily overcome. The chains of oppression are fragile. The real problem now is mental attitude. The oppressed are afraid to move and feel powerless. But this is a conditioned response. It is time to stop thinking of oneself as a victim and claim the power that one has. There is no oppression greater than the belief that one is oppressed.